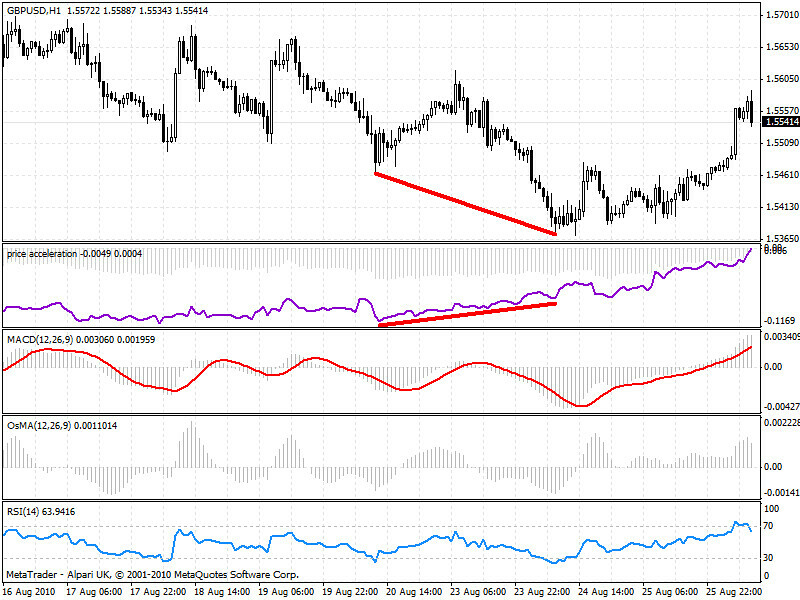 This is a simple indicator that works very well to spot divergence and so changes in the trend. The speed (histogram) is what is commonly called the “momentum”. The acceleration (yellow line) is the speed of the speed and is, in my opinion the perfect indicator, to spot divergences. 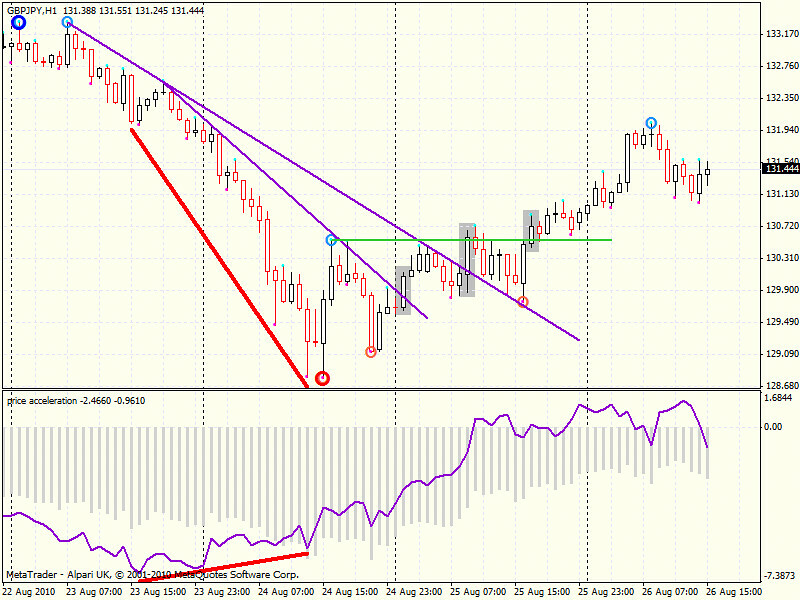 Divergences are usually used to spot the possibility of a trend change. When you drive your car, and want to make a turn, you need to reduce your speed. You do that by pushing the brakes. So while the speed is slowing down, the acceleration has already became negative. So the acceleration usually gives you information of a trend change much before the speed does. Sometimes too much, so be careful using it and never use it alone. 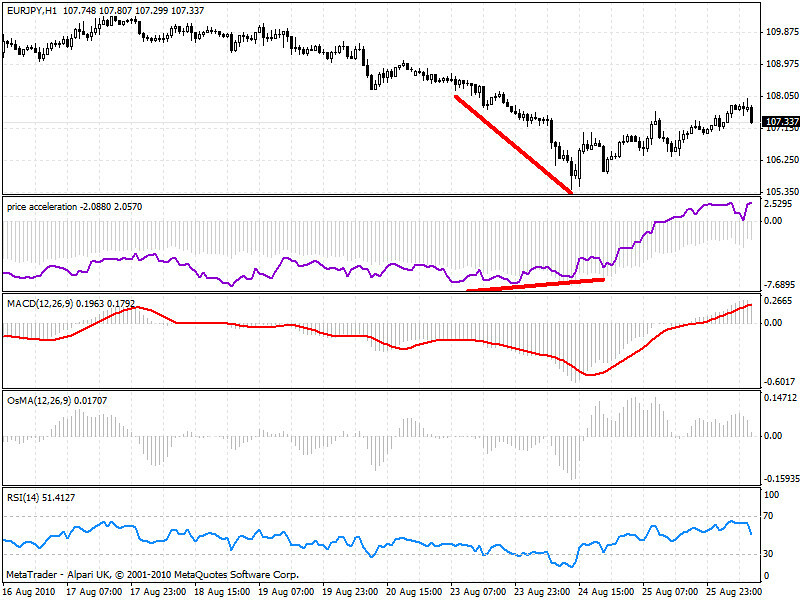 Below are two example of the indicator, a regular version and a smoothed version (using Hull Moving Average). The yellow line is the acceleration and the blue histogram is the speed of the price. Right click the link and select “Save as”. Copy the file into your “MT4 installation dir/experts/indicators” folder. 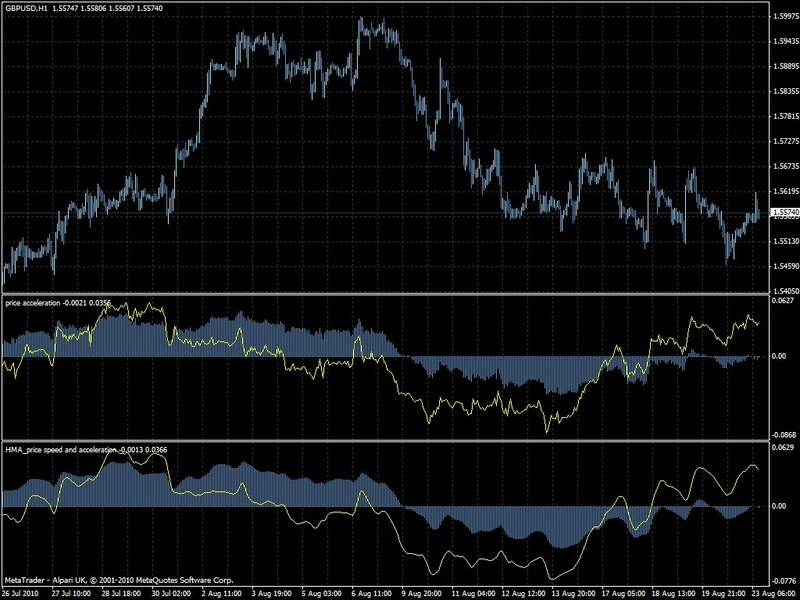 Restart MT4 and you should see the indicator listed under “Custom Indicators” section of the Navigator window. Will give it a try along side my rsi and see how it compares. This is the first freebie… more will come shortly. El indicador "price speed and acceleration.mq4" NO LO PUEDO DESCARGAR. right click here: http://pimpmyea.com/downloads/price_speed_and_acceleration.mq4 and “save as” to your desktop or wherever. Then copy it into experts/indicators directory. Price Speed And Acceleration looks very interesting, I like the smoothed version. Does the download offer both versions or is there a setting in the indicator for both versions? Thank you for sharing a freebie. How does price speed work, and what are the best setting for 1 hour, 4 hour, and daily charts? I usually use periods that have a meaning. On a 1H chart I usually use 24 for fast setting and 120 (5 days/1week) for the slow one. On a 4H chart I use 30 (5 days) for fast setting and 120 (4 weeks) for the slow one. For daily you can use 20/24 (about 1 month of trading) and 120/240 (about 6 months/1 year of trading). I don't understand 'fast' and 'slow' setting. 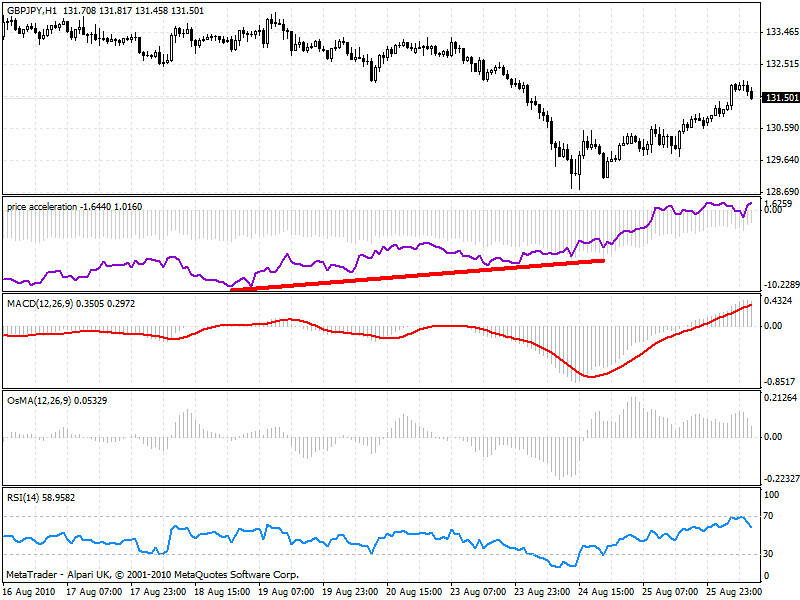 You can apply the indicator more than one time to the same chart to have a "broader" view. A fast one (meaning one looking at what's happening recently) and a slow one (looking at a wider range). What settings do you recomend on the weekly chart? for a weekly chart I’d use a 27 or 54 period value. That is 6 months or 1 year. Try them an see if they give good signals. Thanks Andrea, another great tool for the kit. I have often wondered whether an EA strategy could be based on something like this sensing price change relative to time. This is a tool that I developed for manual trading but in a different way can also be used for automatic trading to measure “momentum”. 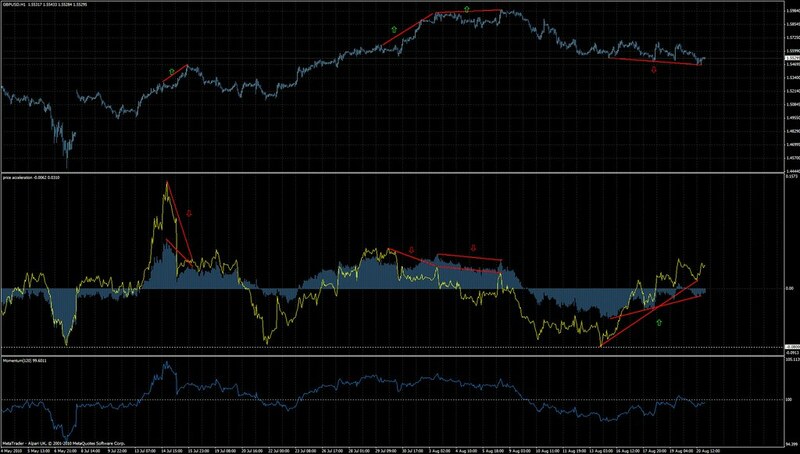 Despite of the fact that I can code an EA trading divergences my experience tells me that it is not a strategy that works for automatic trading. Divergences are very “visual” and that means that they work because of the trader “experience”, exactly the kind of thing that you can’t code in any EA. Yes that indicator is very simple but in my opinion very powerful. Have you seen a similar indicator that can act on tick data? Or on price movement between short intervals (say 100ms). The challenge I see is that I cannot use iclose or any other Timeseries access function as those are working on at best 1min chart information, and that is too slow for my needs. 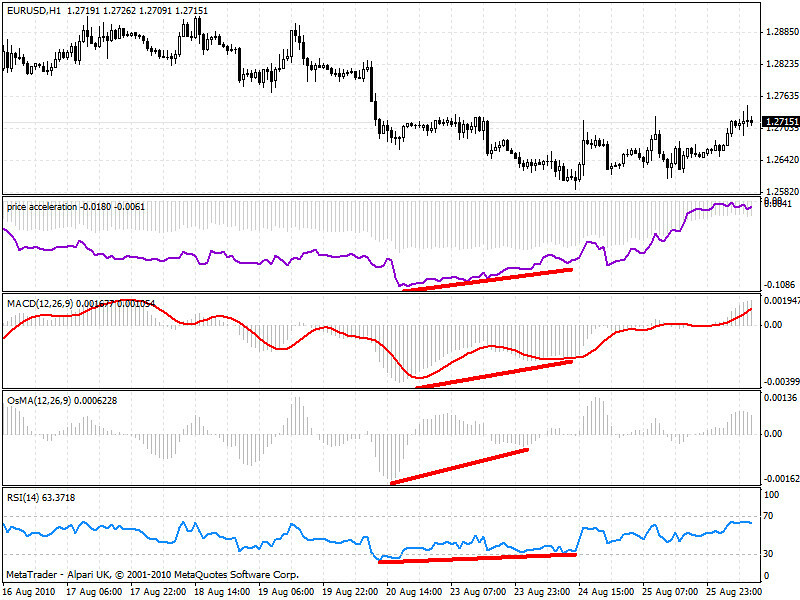 the problem is that on MT4 everything is tick/bar releated and not on time relation. The distance between each tick maybe a few ms to seconds depending on the market liquidity and on the broker data feed. I already coded a set of indicator doing a tick analysis and I’ll publish them in the coming weeks. I also started coding an automatic scalping strategy working on them but it’ll take time to have consistent results. It shouldn’t take long to publish them so stay tuned. Do you have a mtf and alert version of your price speed and acceleration indicator? no we actually didn’t develop any MTF and alerting version. I downloaded the price acceleration indictaor and attachyed it to my 1hour chart but didnt see the dots(Green and purple) at the end of the candlesticks as in the last picture displayed at this page. the dots are not related to the speed/acceleration indicator but it is a MTF fractal indicator. 1) Assuming the speed is the derivative of the price, the speed should be positive when the price is increasing and negative when the price is decreasing. And it works fine, so I’m perfectly happy with this. But assuming that the acceleration is the derivative of the speed, then the yellow line should be positive when the speed is increasing and negative when the speed is decreasing i.e. the yellow line should cross the zero line each time the blue bars (speed) reache a top or a bottom. And this is not the case in the chart. Do you know why? 2) I like the smoothed version, can you share the mq4 code too? You’re right that the acceleration is the speed of speed. But you should also consider that we calculate that based over a period of time. So there maybe a “shift” in when you have a top/bottom respect the speed. But acceleration is a great “divergence” indicator. In my opinion one of the best. Simple and effective. It shows you when the trend is loosing momentum most of the times in great advance.